Archived News Articles – Delmarva Fisheries Association, Inc.
Delmarva Fisheries Association, Inc. (DFA), as a member of the National Coalition of Fishing Communities, has locked arms with fellow commercial seafood organizations nationwide in supporting Congressional reauthorization of the Magnuson-Stevens Act (MSA) with reforms that enable both sustainable fisheries management and the long-term preservation of our nation’s fishing communities. In a January 31 letter of support to U.S. Senator Dan Sullivan of Alaska, DFA and other like-minded organizations advocate for greater flexibility in fisheries management, without compromising conservation. Record cold weather in early January led to significant icing in large areas of the Chesapeake Bay. Icebreaking ships worked to keep shipping lanes free, and NOAA technicians responded to protect the Chesapeake Bay Interpretive Buoy System buoys and sensors from ice. But the effects of this icing on the bay’s crabs, oysters, and finfish may take longer to play out. This Petition was recently circulated, widely endorsed by local residents and submitted to Maryland Governor Larry Hogan, DNR Secretary Mark Belton, State and local elected officials and various watermen associations. For more information, contact Dory Matarazzo (smithislandmotel@gmail.com). 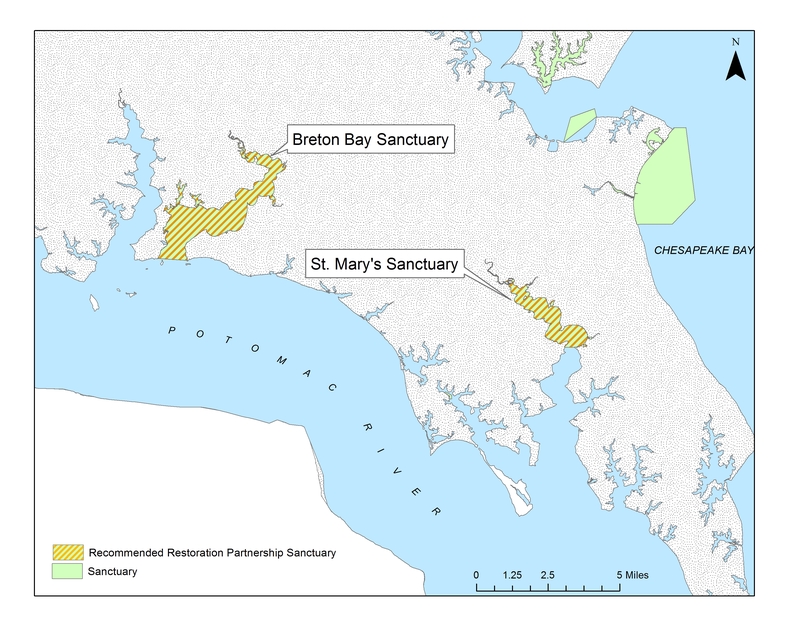 The Maryland Department of Natural Resources today announced a comprehensive plan on oyster restoration, including its intention to recommend Breton Bay and the upper St. Mary’s River as the fourth and fifth tributaries to satisfy the state’s commitment to the Chesapeake Bay Watershed Agreement goal of restoring native oyster habitat and populations in five tributaries by 2025. The department’s selection complements ongoing large-scale oyster restoration activities in Harris Creek, the Little Choptank River and the Tred Avon River. The recommendations will be shared with the Maryland Oyster Restoration Interagency Workgroup, which includes the National Oceanic and Atmospheric Administration and U.S. Army Corps of Engineers. The department will also gather input from citizens, communities and stakeholders in an open and transparent public comment process. Breton Bay intends to be restored with the assistance of the state’s federal partners while work in the upper section of the St. Mary’s River would be conducted by the state. All contracts for seed planting and substrate placement in the final two restoration sites will be competitively bid. Along with its restoration selections, the state also plans to study and survey existing state oyster sanctuaries around Annapolis and the Lower Eastern Shore. For the first time, the department will design and develop oyster management plans for the Manokin, Nanticoke and Severn rivers to determine how the strategic use of state investment and resources, including seed, shell and spat, could spur natural oyster growth and reproduction. Lastly, the department intends to move forward with developing a rotational harvest system, designating a seed study area, and renewing the state’s oyster shell collection and recycling programs. The state’s oyster restoration plan was formed, in part, from feedback from the Oyster Advisory Commission, which includes academics, conservationists, legislators and watermen. Was Virginia wronged in a decision to raise quota for a fish called manhaden? NOAA’s network of Habitat Focus Areas (HFAs) tackle a wide range of habitat issues, including reducing sediment and nutrient runoff, improving coral health, restoring salmon habitat, and preventing the spread of invasive species. Look back at several completed and ongoing keystone projects in Habitat Focus Areas in 2017 – including the Choptank River HFA in Dorchester County. DFA corresponded this week with DNR Secretary Mark Belton about the upcoming ASMFC meeting and pending Amendment 3 concerning Atlantic menhaden. See the Letter to Secretary Mark Belton and ASMFC Amendment 3 Fact Sheet.